despite making a bright start against the National Champion London Olympians on Sunday at Aldershot Park. Offense, lead by QB Stuart Franklin, and forced a punt. opening score. Steve Belcher kicked that PAT conversion and the Knights lead 7-0. The remainder of the 1st Quarter saw both teams stiffen on defense forcing a further exchange of punts. 14-0 after Belchers extra point. over under centre. This brought immediate success as the faster release from Lineham saw the Olympian receiving trion of Clive Palumbo, Junior Price and Dwayne Clarke making in roads into Knights territory. The home defense were kept honest by intermittent barrelling runs from tailback Mike Sobanjo. The drive was completed by Linehams 4yard pass to Palumboand the extra point conversion took the score to 14-7.
teams offense embarked on another good drive with the clock inside 2 minutes and looked likely to add points before halftime - it was at this point however that the momentum of the game turned. The 3rd quarter then turned into a Knightmare for the home team. go the Knights were in trouble as an errant snap saw the ball turned over on their own 15yard line.Three strong runs from Sobanjo saw him crash into the endzone from 6yards out to give the Olympians the lead for the first time. Coppinger and a 14-22 lead for the visitors. his receiving corps. Two further 3rd Quarter touchdowns from 14 yards ans 21 yards saw the Londoners in complete control with a 14-34 lead. The Knights rallied in the 4th Quarter. 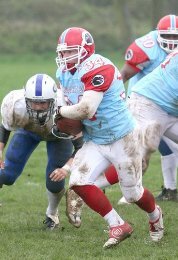 The Offense were back on track but a fine defensive play saw the Londoners hold off a determined Knights drive as QB Heath suffered a second interception - this time in the visitors endzone. Franklin returned under centre. It was the Olympian offense that now stalled and the Knights had a chance to take over in good field position. third time. This time the visitors got the ball after opportunities for both teams to recover it. They then ran out the clock and recorded an important win at the expense of the Knights. end of our season. The league is extremely competitive this year - that game could have gone either way. It makes our remaining three games all the more significant. We currently have two losses, as do the London Blitz and the Southern Sundevils. We play the Blitz twice, we have the tie breaker on the Sundevils and our final score today sets us a target to win by 14 points when we go to the Olympians on the 6th August. Its all still in our hands." by presenting him with an engraved decanter after the game.